Cinque Terre is a string of five towns on the Italian Riviera known for its colorful seaside houses and rewarding hikes. As if that alone is not enough, it is also the birthplace of pesto and the seafood is as fresh as can be. It is a wonderful place - one I highly suggest visiting. Need more Cinque Terre information? Click here for everything you need to plan your Cinque Terre trip! Home type. Because I personally only book entire apartments/homes, that’s what I recommend. If you are looking for individual rooms for rent in Cinque Terre, this is not it. Price. Since I know a lot of people are looking for cheap hotels in Cinque Terre, I picked out Airbnb options at all price points. Spoiler alert: there aren’t really hotels there, just b&bs. Overall aesthetic. Cause it’s gotta be pretty, of course ;) I was especially looking for a handful of options with a beautiful view because that is ideal. Rating and reviews. They are all extremely highly rated (at least 4.5 out of 5), with plenty of reviews, and ideally owned by a superhost. New to Airbnb? Click here to get $40 off your first booking! Let’s also talk about location. As mentioned, there are five Cinque Terre villages. Unlike the Amalfi Coast and other similar places, it is incredibly easy to get from town to town. You can do so via train, on foot (via the Cinque Terre walk ing trails), or by boat (except Corniglia). Because of this you could book Cinque Terre accommodation in any of them which is why I have included options for each. Monterosso — the northern most village. It is home to the best beach in Cinque Terre and the most shops, hotels, and restaurants. It is mostly flat, everything is very spread out, and it’s the most modern. Vernazza — arguably the most picturesque village. I found Vernazza to be the perfect size (not too big, not too small). It has a natural pier and a small beach. Corniglia — the only village not accessible by sea. You can arrive here by train or on foot. It is incredibly small. This is the town I would least recommend staying in. Manarola — while most people find Vernazza to be the most beautiful, I found Manarola to be breathtaking. There is no sand beach here but there is a gorgeous harbor and a bunch of rocky cliffs that people dive from. Riomaggiore — the most southern and easternmost village. It is shockingly the largest (I could have sworn Monterosso was!) and has a beautiful harbor. It is the closest to La Spezia. I personally stayed in Vernazza while visiting Cinque Terre and I found it to be the best town to stay in Cinque Terre. It’s not too big but also not too small and there are plenty of places to eat which make it incredibly convenient. At night it’s quite lively unlike the smaller towns. But I also have other friends who stayed in a different village and found it to be their favorite, so don’t take my recommendation as a requirement! It is hard to choose one best village in Cinque Terre when they are each great for their own reason. Browse the list below and go with whichever b&b Cinque Terre works best for you. Looking for info on the Cinque Terre hike, how to get to Cinque Terre, where to eat, and more? Click here for everything you need to plan your Cinque Terre trip! This Cinque Terre b&b, poorly named “Bright Light”, is one of the best places to stay in Cinque Terre! It is located in the village of Riomaggiore and has an unbeatable seaview from the extra large terrace. It fits up to five people yet is reasonably priced starting at $115. The unanimous five star rating after almost 200 individual reviews speaks for itself, really. Plus 100% of guests gave the location a 5-star rating and it’s owned by a superhost! Bright Light is two minutes from the marina, three from the beach, five from the station, and just one minute from the center of town! It’s newly renovated, has AC in some rooms, and free wifi. Next up on our accommodation Cinque Terre Italy list, another breathtaking sea view apartment. This one is in the village of Vernazza, my favorite! 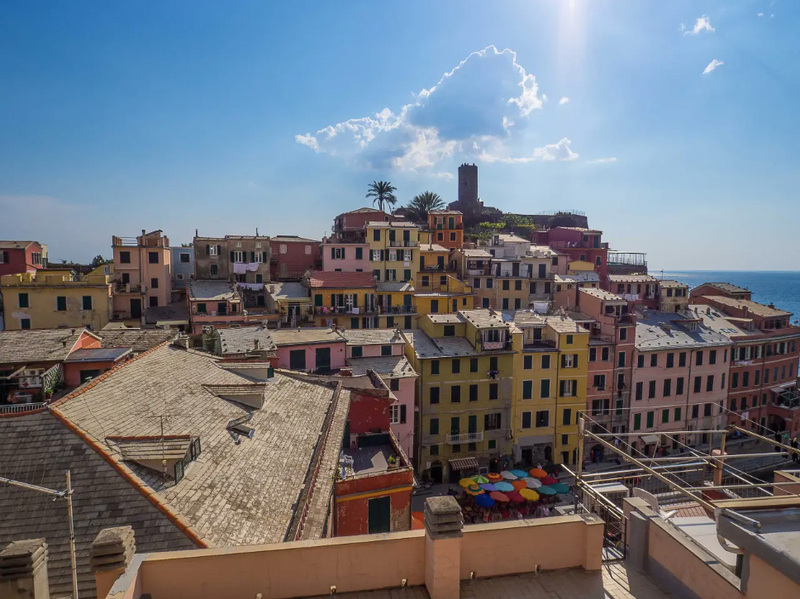 I chose to recommend this 5 terre hotel because it is located in the center of town, a private balcony with the prettiest Vernazza view, and is rated 5-stars by over 400 past guests. This apartment has two bedrooms with room for four people total. There’s no AC but it doesn’t seem to be an issue based on the reviews! Instead there are fans and a natural breeze running through. 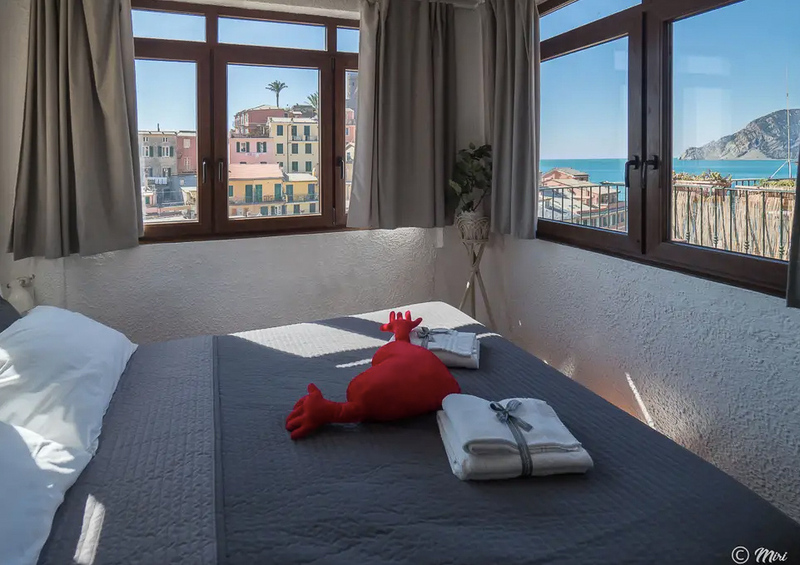 If you are hunting for Monterosso Cinque Terre hotels, consider this amazing Airbnb apartment instead. And especially if you are looking for cheap hotels in Cinque Terre because this place fits four people yet somehow starts at $63 per night. Mind blown? Me too. Location-wise it’s in Monterosso about 800 feet from the sea, 3 minutes from the train station, and 8 minutes from where the ferries arrive. The reason it is so inexpensive despite fitting four seems to be the fact that there aren’t two full bedrooms, just one. The common space has two single beds. If you are a family or a group that doesn’t mind this scenario, this option can’t be beat for the price! Next up on the Cinque Terre apartments with amazing views for incredibly cheap prices list, 5 Sensi di Mare! With a unanimous 5-star rating after over 100 reviews, it’s clear that this Riomaggiore gem is a hit. In addition to the view which I think really speaks for itself, there’s room for four guests in two bedrooms, it’s centrally located, and fully equipped with everything you need. If you’re searching for Cinque Terre hotels luxury, consider this beautiful apartment instead ! It’s luxuriously decorated and even has a fancy jacuzzi tub. Plus you can’t beat the terrace sea view of Vernazza. Another great hotel Cinque Terre Italy alternative is this picturesque apartment in Vernazza with some of the best views in town! It is centrally located and was recently renovated and redecorated back in 2017. There is room for four but there is only one bedroom so some will need to sleep in the common area. It does have air conditioning in case that is essential for you! 5 Terre D’Amare is another great option in Riomaggiore with views of both the village and the sea! It fits four and has over 100 5-star reviews. It’s not as easy to get to as the other options (some described it as “a bit of a trek”) but perfect if you’d like to be a bit more remote. Plus being less central means that the views are even better! A recently renovated penthouse?! Yes please! It’s located in Monterosso and is much further from the beach than the other options. If you want to be a bit more remote in Monterosso, this is for you. It fits four, is quite large, and they’ll even let you drop your luggage at the apartment before check-in time if needed. Interested in being even more remote?! I found Corniglia to be the sleepiest town of all, and that’s where this apartment is located. The flat itself does not have views but nearby there is a nice lookout point, “Santa Maria”. If you are looking to stay very inexpensively, this is a good choice. It fits four, is a 10 minute walk from an inlet for swimming, and has over 300 5-star reviews! It even comes with breakfast. Last on the Vernazza list, this double room apartment with a stunning sea view terrace. It is quite small but starts at only $38 per night. If you are a duo who plans to spend most of your time outside of your accommodation and is looking to save some money, this apartment is a good choice for you. Another highly rated Corniglia apartment. It’s centrally located, has a terrace with a beautiful view, and even offers free parking. It fits up to three people. The last of my Cinque Terre apartments recommendations - one in Manarola! If Manarola is your Cinque Terre village of choice, over 300 people agree this is the best. It has a view, fits two, and is equipped with things like a fully furnished kitchen.